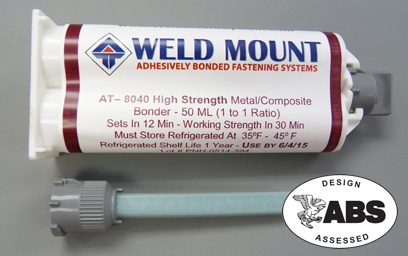 The heart of the Weld Mount System is our acrylic adhesives which have been specifically formulated to be used with our parts. They are high strength/high viscosity methacrylates with incredible strength in both tensile and in shear. 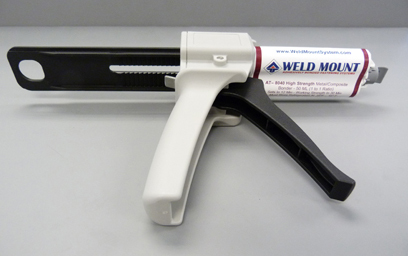 We have a range of different adhesives depending upon your application requirements. Be sure and watch the site videos for further technical details on each adhesive as well as installation instructions. 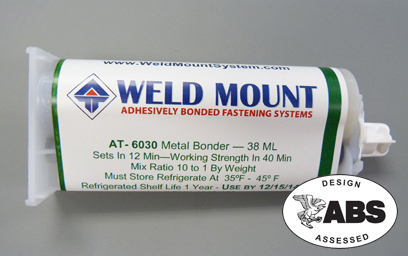 AT-6030 is a 10 to 1 metal bonding adhesive. It has high viscosity and cures in 10 - 12 minutes, has a 6 minute working time and develops working strength in 40 minutes. AT-6030 develops in excess of 2,500 lbs (psi) tensile strength on most metal surfaces making it an ideal alternative to welding in many applications. AT-6030 has a 6 month shelf life and should always be stored refrigerated. 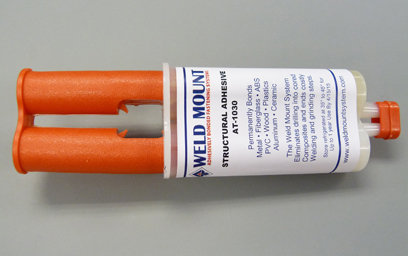 Packaged in a 38ml cartridge this adhesive must be used with our AT-300 gun, AT-12 plunger and and AT-650 mixing tips. The 38ml cartridge will bond 80 – 120 parts. 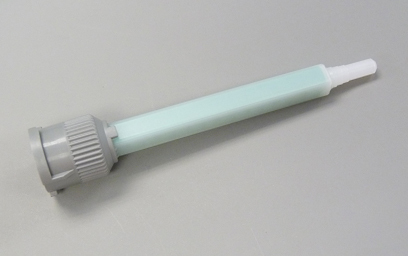 AT-1030 is a good general purpose adhesive packaged in a manual plunger cartridge. Simply snip off the two end caps and dispense the needed amount of adhesive onto a clean surface and mix it by hand. AT-1030 cures in 10 - 12 minutes, has a 6 minute working time and develops working strength in 40 minutes. AT-1030 has a 12 month shelf life when stored at 72 degrees. 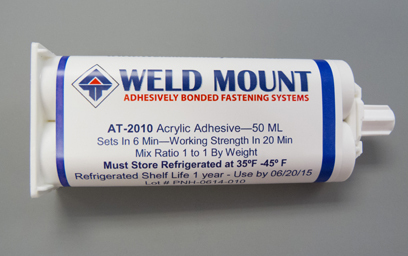 We recommend that where ever possible this adhesive be refrigerated. 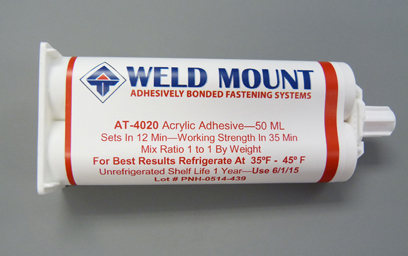 Packaged in a 30ml cartridge this adhesive does not require the adhesive gun or mixing tips. The 30ml cartridge will bond 30 – 50 parts. 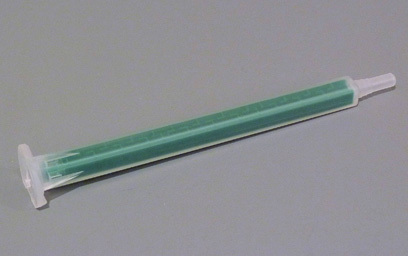 The 3.25” AT-650 mixing tip is for use with AT-6030 and AT-4020. The 3.25 inch significantly reduces waste over the traditional 6 inch tip. Each package contains 10 mixing tips. The NEW at-850 tip is for use with AT-2010 and AT-8040. It’s unique design eliminates any possibility of the cartridge plugging up as the entry is separated.